When you think of Scotland's most famous lake, you'll also think of Britain's most famous monster: Nessie (aka, the Loch Ness Monster). Although Nessie hasn't put in an appearance for decades, no place does a better job of keeping the centuries-old legend alive than the Loch Ness Centre and Exhibition, with its displays relating to the famous "beastie" and the history of the surrounding area. Even without its engaging tales of monsters, Loch Ness is extremely beautiful, especially around the romantic ruins of Urquhart Castle on its shoreline. Loch Ness stretches along the Great Glen, a fault line where the tectonic plates collided to create the surrounding mountains. 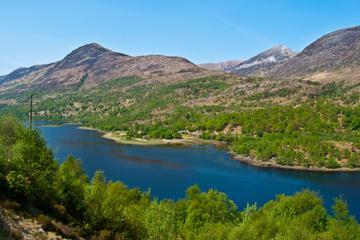 And at a depth of 755 feet, it's Scotland's second deepest loch. Loch Ness and its surrounding attractions are close enough to both Glasgow and Edinburgh to be reached on day tours from either city. St. Columba, an Irish missionary, is said to have been the first person to encounter the oldest inhabitant of Loch Ness, when the monster dragged the (soon-to-be) saint into the impenetrable depths. Then, in the 16th century, Hector Boece mentioned in The History of Scotland that a "terrible being" had suddenly emerged from the water and swallowed three men. The next sighting, in 1933, took place while a couple sitting on the north bank saw a strange, writhing creature cross the road in front of them. A number of snapshots and eyewitness reports followed, not to mention a growing stream of visitors. Most descriptions say it resembles a large sea reptile with a long neck, a small head, fins, and several humps. The most famous picture of Nessiteras Rhombopteryx, to give Nessie its full name, came from London gynecologist Robert Wilson. On April 19, 1934, Wilson reported seeing something on the water and took a snap: a long neck of the monster had just emerged from the ice-cold water. It later turned out that Wilson belonged to a team who had set out to play a trick on the media. Shortly before his death in 1993, Christian Spurling, one of the "conspirators," admitted his part in the great deception. According to the Sunday Times, Spurling, an amateur woodworker, had rigged up a dinosaur dummy on a toy submarine. The ruse worked perfectly. The impressive ruins of Urquhart Castle-located just a few minutes from Drumnadrochit-stand on a tongue of land jutting out into Loch Ness. Set against the backdrop of lake and mountain, the castle, once one of Scotland's largest fortifications, is at the center of many ancient myths. Dating from the 12th century, it was a typical example of a motte and bailey fortification, but in the 14th century, stone walls replaced the original wooden structure. Then in 1509, James IV gave the castle to John Grant of Freuchie, who commissioned the extension to the keep, and at the end of the 17th century, the fortified castle fell victim to a fire. Often making appearances in TV shows and movies, the castle was recently featured in an episode of the hit Outlander series. Today, visitors can enjoy on-site facilities including a café, gift shop, and stunning views of the loch. At the head of Urquhart Bay on Loch Ness's northern shore, the village of Drumnadrochit is a great place to begin exploring Scotland's most famous lake, along with its many myths and legends, as well as nearby Urquhart Castle. You'll find plenty of things to do here. In addition to guesthouses, bed-and-breakfasts, cafés, and gift shops, it's home to the Loch Ness Centre and Exhibition, which tells the fascinating story of the loch's most famous resident, Nessie. It's also a great place to take a boat cruise to do some monster spotting for yourself, go fishing, or simply enjoy the loch's stunning scenery. The village is also a popular spot for horse riding and pony trekking excursions. Exhibits here use audio-visual techniques and static displays to recount the evolutionary history of the region and its famed Loch Ness Monster. You can read up on the latest developments in the search for the monster and see depictions, newspaper headlines, and underwater photos. The most interesting display focuses on Operation Deepscan in 1987 and includes sonar readings from the murky waters of Loch Ness. The images seem to confirm the existence of something down there, and the study certainly didn't rule out the existence of the beloved monster. The center also features a café and gift shop, as well as a small hotel, and offers regular boat trips on the Deepscan research vessel itself for those interested in learning more about the monster and the loch while enjoying the spectacular scenery. Another monster-related exhibit is at the nearby theme park, Nessieland. Fort Augustus, at the south end of Loch Ness, is a favorite spot for tourists for its picturesque setting on the Caledonian Canal. One of the top free things to do here is simply sitting alongside the water and watching the boats head out into the loch. Be sure to also pop into the interesting Caledonian Canal Heritage Centre, which provides plenty of detail regarding the construction and subsequent history of this major feat of engineering. The fortress gave the place its name and was built in 1715 to become the headquarters of the English General Wade in 1729. After changing hands a number of times, the greater part of it was demolished in 1876. Benedictine monks have since built an abbey and a highly regarded school on the site. Another nearby attraction is the magnificent waterfall at Foyers. The Caledonian fault has been used for transport since Thomas Telford completed the Caledonian Canal in 1849 (work had begun in 1803). Stretching from Fort William and ending in the east at Inverness, the canal spared ships the hazardous northern route through the Pentland Firth between the Scottish mainland and the Orkneys. Only a third of the canal's length is man-made, the major part of it consisting of narrow lochs including Loch Linnhe; Loch Lochy; the small Loch Oich; and then the longest (and best-known), the 24-mile-long Loch Ness. All told, the canal (including lochs) extends 60 miles and passes through 29 locks, the most impressive group of which are the eight locks of Neptune's Staircase. Today, it's the leisure industry that makes most use of the canal, with holidaymakers in rental boats and canoes enjoying the magnificent scenery along the waterway. A little to the south of Loch Ness is the road to the village of Spean Bridge, offering splendid panoramas of the Caledonian fault and the northern side of Ben Nevis. Spean Bridge makes an excellent base for walks through the Glen Roy National Nature Reserve, with its "Parallel Roads," as the terraces that run along the slope are called. These indicate the various water levels of a Pleistocene lake that was dammed by Ice Age glaciers. It's also where you'll find the Commando Memorial, a monument dedicated to the men of the British Commando Forces who trained at nearby Achnacarry Castle. The small islands in Loch Oich to the south of Loch Lomond are set against a backdrop of steep hillsides and make a picturesque sight. On the west bank of the loch near a spring known as Tobar nan Ceann stands a remarkable memorial to a bloody incident that took place in the 17th century. Here, seven brothers were executed for the deaths of two members of the Keppoch family: their heads were washed in the spring before being presented to the clan chief. Invergarry is another good base for hill walkers and is also a popular center for anglers as well as horseback treks through remote Highland glens and mountain passes. Luxury Hotels: The chic The Lovat, Loch Ness is a four-star hotel in Fort Augustus within easy reach of the best attractions. Set in a splendid old Victorian building, it offers fine dining, homemade cookies, and a fireplace. Those seeking a luxury B&B experience would do well to stay at the delightful Loch Ness Lodge, with cozy rooms offering great water and mountain views, and a delicious full Scottish breakfast. Expect equally high quality at the elegant Loch Ness Country House Hotel at Dunain Park, a great choice for its woodland setting, large gardens, and comfortable four-poster beds. Mid-Range Hotels: The Glenmoriston Arms Hotel is a great mid-range Invermoriston hotel, offering a beautiful setting, friendly staff, and a full Scottish breakfast. Also worth considering, the Loch Ness Clansman Hotel offers bright, comfy rooms just steps away from the lake and the departure point for boat cruises; and the Loch Ness Inn, a quaint-old loch-side hotel offering traditional Scottish breakfasts and evening meals. Budget Hotels: A great value budget stay can be enjoyed at Serendipity Bed and Breakfast, a top-rated guest house in Glenmoriston set amid gorgeous scenery, with fantastic hosts and an excellent breakfast served with homemade jams. The Cluanie Inn is another good choice and comes with affordable rates, a mountain setting and hiking trails, along with traditional Scottish food and free parking. Finally, look into Morag's Lodge, an affordable location in Fort Augustus that offers dorm rooms and separate family rooms. Tours of Loch Ness: On the 12-hour Loch Ness, Glencoe, and the Highlands Small-Group Day Trip from Edinburgh, you can travel to the highlands by minibus with an expert guide, visiting Spean Bridge; Cairngorms National Park; and Fort Augustus, where you will have time for an optional cruise on Loch Ness. The Loch Ness, Glencoe, and the Highlands Small Group Day Trip from Glasgow departs from central Glasgow, following much the same route, and also allows plenty of time for a cruise of Loch Ness. 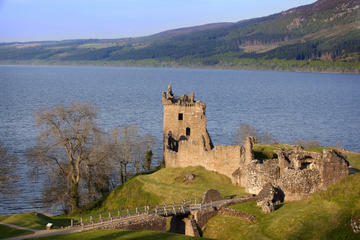 Getting to Loch Ness on Your Own: The train from either Edinburgh or Glasgow to Inverness takes about 3.5 hours. From here, it is about a half-hour bus ride to Drumnadrochit. Scotland's Top Cities: Scotland's beautiful capital city of Edinburgh is a big tourist draw, not least of all for its magnificent medieval architecture, including the majestic Edinburgh Castle, connected to the historic Palace of Holyrood by the cobblestone Royal Mile. Widely regarded as the country's culture capital, the port city of Glasgow is home to a magnificent cathedral, great museums, and top art galleries including Kelvingrove Art Gallery and Museum. The country's third largest city, Aberdeen is definitely worth exploring for its fabled architecture built from local stone. Scotland's Top Sights: If you've not had your fill of magnificent scenery, take a drive to the equally attractive Loch Lomond, popular among hikers and sightseers for the beautiful Loch Lomond and The Trossachs National Park. And of course Loch Ness is just a short drive from the lovely city of Inverness, doorway to the many lovely sights and attractions of the Scottish Highlands. The beautiful scenery of the Isle of Skye, too, is worth including on your Scottish travel itinerary and is also popular with hikers and backpackers. Scotland Travel Ideas: Scotland is a great travel destination for sports enthusiasts, especially golfers, many of whom arrive solely to play on the world's most famous courses in St. Andrews. Culture lovers would do well to pay a visit to the birthplace of Robbie Burns in Ayr, while history buffs and train fans should make a point of making the rail journey over the famous Forth Railway Bridge to the lovely city of Dundee, the country's fourth largest city and a great base from which to explore the country.